One of the world’s leading golfing establishments, Sentosa Golf Club has celebrated the start of what promises to be a memorable year by launching a unique campaign designed to increase awareness of the game among youngsters in the local community, as well as drawing attention to sustainable practices within golf. 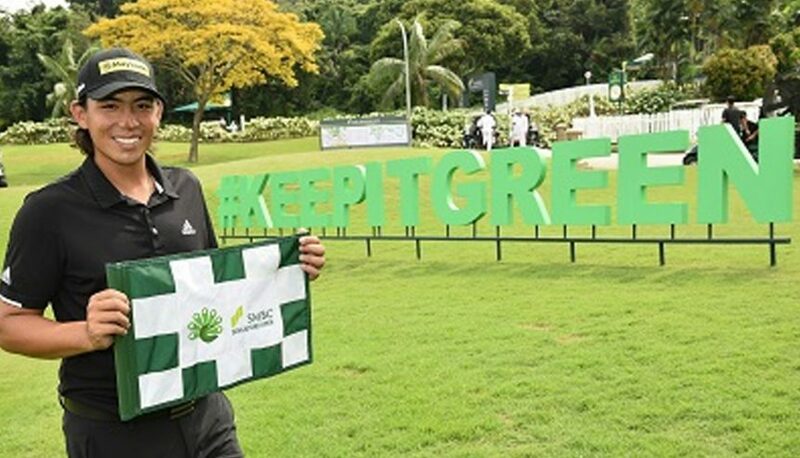 #KeepItGreen was unveiled by rising golf star Gavin Green on the eve of the 2018 SMBC Singapore Open, being staged for the 11th time at Sentosa Golf Club, a Golf Course Facility Member of the Asian Golf Industry Federation. Once again, the event is taking place over its revered Serapong Course, voted the Asian Tour’s ‘Best Golf Course’. The big-hitting Malaysian will support the #KeepItGreen campaign throughout the tournament, with Sentosa Golf Club in association with the Singapore Golf Association, by offering free rounds of golf to local juniors for every green in regulation that Green hits during the four rounds. Supported by the game’s most influential stakeholders, including The R&A, the SMBC Singapore Open field, as well as the club’s membership and tournament spectators, #KeepItGreen seeks to amplify crucial messages which are of increasing importance to the sport. As one of the most sustainable tourism destinations in the world, Sentosa Island, upon which the golf club and its two courses are set, is uniquely placed to contribute on two very topical subjects within the game. The SMBC Singapore Open is the first of four prestigious tournaments to take place at Sentosa in 2018. The venue will also stage the Women’s Amateur Asia-Pacific Championship, the HSBC Women’s World Championship and the Men’s Asia Pacific Amateur Championship, each of which will deliver television audiences into the tens of millions and attract some of the biggest names in male and female amateur and professional golf.